We are delighted to have won a Heritage Angels Award for our Sperrins Stone Walling project in partnership with Sperrins Gateway Landscape Partnership. 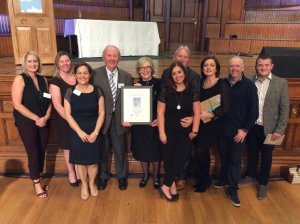 The prestigious Heritage Angel Awards celebrate the efforts of people or projects who champion and go to extraordinary lengths to protect, save, record and share their local heritage. Sperrins Stone Walling was a partnership project between Sperrins Gateway Landscape Partnership and our ‘Up for Work’ programme and offered work based training for unemployed people in the Mid Ulster area whilst restoring and preserving the areas built heritage. Some 70 individuals participated on the project and gained experience and accredited qualifications in heritage skills. This included developing metal work skills for repair of iron gates and stonemasonry skills for conserving and restoring stonemasonry. Participants also gained a sense of achievement at being part of a team working for the benefit of their local area. During the project participants used their new skills to rebuild two lime kilns and restored traditional gates, walls and pillars in the Moneymore and Draperstown areas. The Sperrins Gateway Landscape Partnership was a £2 million scheme that aimed to ensure that the natural, cultural and built heritage of the Sperrins would be safeguarded for future generations. The initiative was delivered by a partnership made up of regional and local organisations, community groups, schools, landowners and members of the community with an interest in the heritage of the area. The partnership included our work based training programme ‘Up for Work’ which was part funded by the Northern Ireland European Social Fund (2007-2013) and the then Department for Employment and Learning.